The new UBC course “History of Cantonese Worlds” has attracted a fair amount of local Chinese media attention since its launch in September 2018. A recent column in The Hong Kong Economic Journal titled “When Cantonese is lost, we resort to Canada” 粵失求諸加 laments the grim future of the Cantonese language in Hong Kong but offers hopes of seeing its growth in Canada. This talk will reflect on the experience gained in the preparation and teaching of this new course and examine the responses it has received from both local and overseas communities. Clement Tsz Ming Tong is Visiting Assistant Professor of the Department of Asian Studies at the University of British Columbia. He is an Assistant Professor in Biblical Studies at the Carey Theological College, a former lecturer of translation skills and contextual cultural studies at Simon Fraser University, and a former instructor of Greek and Hebrew languages at the Vancouver School of Theology. He is the author of Revelation and Text: Story of the Chinese Bible (1807–1919), and he is involved in several Hong Kong-themed projects that have resulted in works including “The Hong Kong Week of 1967 and the Emergence of Hong Kong Identity Through Contradistinction” and “Translating Memories: The Fight over Pikachu in Hong Kong.” Dr. Tong is currently working on a project regarding the study and writing of the Cantonese language in 19th-century China. 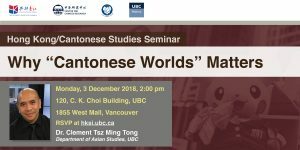 This public seminar is organized by the UBC Hong Kong Studies Initiative and co-sponsored by the Department of Asian Studies, Department of History, and the Centre for Chinese Research. Sorry. Our online registration form is now closed. To find out if it is possible to still attend, please email hksi.ubc@ubc.ca.